Why do you remember some photographs? At what level of mind do they etch? We, humans, move in a world full of impressions and in some way the information is stored in our brains. I think it's like Photoshop Lightroom's cataloguing, memories get colours, flags, points and they end up in folders and are systematized to be picked up later. Some impression is far into the system, others sink away and are forgotten. Maybe not because they were bad, but maybe because the impression did not get caught. Most of the photographs I remember are from famous places I've seen countless times. I could probably draw the photo from memory. But despite that, they mean nothing to me. They do not get stuck properly. On Instagram, we find a huge flow of amazing photos. You can dream away in the big landscapes for a while, travel for a moment, all with a cup of tea to sip, a perfect armchair adventure. But very few pictures get stuck in my soul. But there are some photographs that grab me and do not seem to lose their status. Most are pictures of people, but also landscapes of course. When I got the question of writing "Endfmrame", Initially it bothered me. 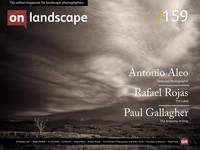 Like all readers of ”On Landscape”, I also wondered what image I would choose if I got the question. So I made a plan, one that would limit me to my task. I decided to read through my photographic books and just choose from them. That means that about 100 books would be browsed and I would come to regret that decision. You can get too much of a good thing. But, of course, I found the photo. It was like the sound of a bell within me when I browsed the page. I knew I did not have to look any further. Jan Töve's photograph has been with me since the book came out in 2001 and I realised that I have made many attempts at similar photos all with Töve as inspiration. But today, the image on the messy swamp forest would not give many likes on Instagram. It's not a place you want to travel to. Nobody will ever be able to sell a single photo trip to a marshland in the middle of Sweden. And yet it has sat in my photo memory.